THIS SOFTWARE IS DISTRIBUTED "AS IS". NO WARRANTY OF ANY KIND IS EXPRESSED OR IMPLIED. YOU USE THE SOFTWARE AT YOUR OWN RISK. ELECTRONICS123.COM, INC. WILL NOT BE LIABLE FOR DATA LOSS, DAMAGES, LOSS OF PROFITS OR ANY OTHER KIND OF LOSS WHILE USING OR MISUSING THIS SOFTWARE. ONE SHOT MODE: Pressing the play button will play the recording once and then stop after the recording finished playing. You have to press play each time you want to play the recording. Pressing play button during playback will stop the playback. 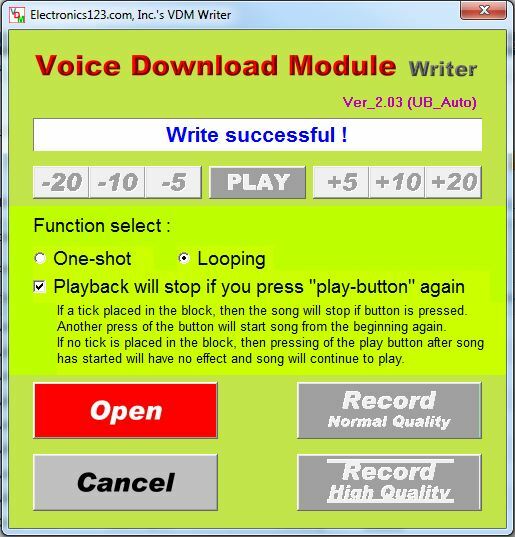 LOOPING MODE:Pressing the play button the recording will start playing and repeating over and over again until the play button is pressed a second time. A second press of the button will halt playback. Pressing the playback button again will start the playback from the beginning again and keep repeating the playback.